Hide deals from seller "1st Duct Cleaning"
Limit 1 per person. Valid on vent cleaning and a full HVAC inspection. By appointment only. Valid for single-furnace homes only. Promotional value expires 90 days after purchase. Ensure clean, breathable air in your home with 82% off vent cleaning and a full HVAC inspection from 1st Duct Cleaning, available within 25 miles of Skokie ($284 value). This thorough service can remove 99.7% off pollutants like dust, pollen, pet dander and chemical fumes from your home's vents and air ducts. 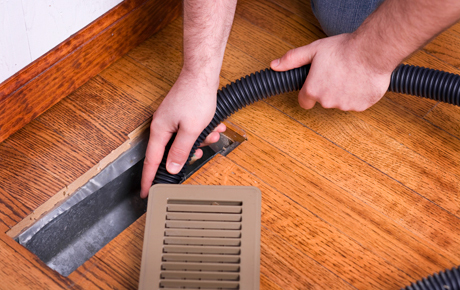 The certified technicians at 1st Duct Cleaning are friendly and highly trained. All of their services adhere to NADCA standards as well as EPA guidelines for safe vent cleaning. With this deal, technicians will open, vacuum, clean, brush, agitate and deodorize each vent under negative pressure. They will also use a mini-camera to inspect the inside of the vents, and they will even clean your dryer vent for optimal maintenance and safety. Breathe easy with this clarifying deal. An air duct cleaning and maintenance company in Skokie offering a variety of services.